Fellow Svengoolie SvenPals from coast-to-coast will be interested in the return of an award-winning cult made-for-TV creature feature from 1972. 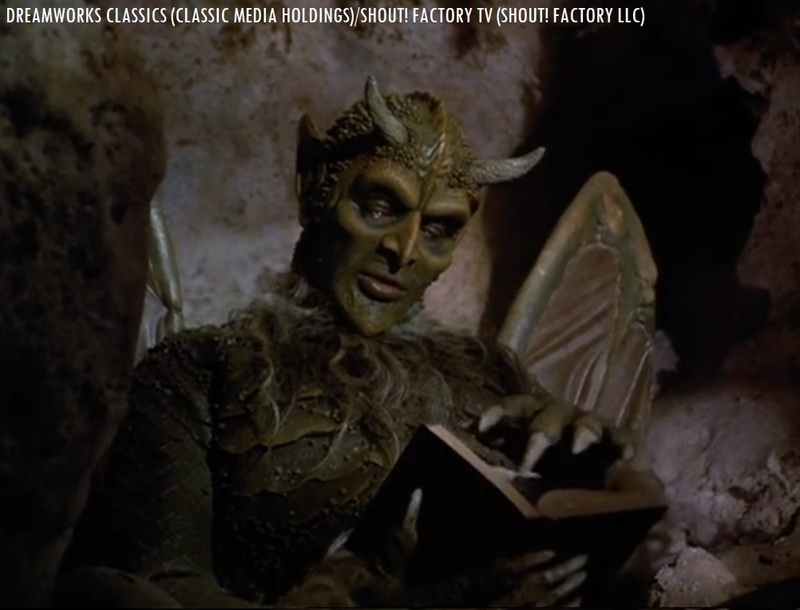 Bernie Casey as the lead gargoyle in B.W.L. Norton’s “Gargoyles” (1972). The legendary Berwyn/Chicago-based horror film host will present the big broadcast return of the made-for-TV film, “Gargoyles” (1972); this Sat., Nov. 3 at 8 p.m. Eastern/7 p.m. Central on Me-TV. “Gargoyles” (1972) was directed by Bill Norton (who was credited under the name of “B.W.L. Norton”), who also directed several episodes of “Tour of Duty” (from 1987-89), two episodes of “SeaQuest: DSV” (1993, with Roy Scheider) and three episodes of the Sci-Fi Channel (now known as “SyFy”) miniseries adaptation of H.G. Wells’ “The Invisible Man” (2001). This will mark Sven’s second coast-to-coast big broadcast showcase of “Gargoyles” (1972) on Me-TV. Sven premiered Norton’s made-for-TV creature feature back in May 2017.
Who was in Norton’s “Gargoyles” (1972)? The players who appeared in Norton’s 1972 made-for-TV creature feature were Bernie Casey (as the main gargoyle), Cornel Wilde (as Dr. Mercer Boley), Jennifer Salt (as Diana Boley), Scott Glenn (as James Reeger), Woody Chambliss (as “Uncle Willie”), Grayson Hall (as Mrs. Parks), Vic Perrin (in an uncredited role as the voice of the gargoyle, dubbing in Bernie Casey’s dialogue), Mickey Alzola, Rock Walker and Greg Walker (the three aforementioned actors played other gargoyles in Norton’s made-for-TV feature). Before he went into the field of acting, Bernie Casey played professional football for the San Francisco 49ers from 1961-66 and the Los Angeles Rams from 1967-68 (according to IMDB). In addition to “Gargoyles,” Casey appeared in numerous made-for-TV and theatrical feature roles throughout his acting career, including “Ants!” (1977, a.k.a. “It Happened at Lakewood Manor,” as Vince), “Never Say Never Again” (1983, as CIA agent Leiter), “Revenge of the Nerds” (1984, as U.N. Jefferson) and “Bill & Ted’s Excellent Adventure” (1989, as Mr. Ryan). 27 years before “Gargoyles,” Cornel Wilde appeared in the title role of Charles Vidor’s Technicolor biopic of composer Frédéric Chopin for Columbia Pictures, “A Song to Remember” (1945). Wilde later directed, produced and appeared in his own adventure drama for Paramount Pictures, “The Naked Prey” (1965). Three years before her appearance in Norton’s made-for-TV feature, Jennifer Salt appeared in John Schlesinger’s “Midnight Cowboy” (1969, in the role of Annie). Five years after “Gargoyles,” Salt appeared in the role of Eunice Tate in the Paul Junger Witt–Tony Thomas–Susan Harris sitcom for ABC, “Soap” (1977-81). 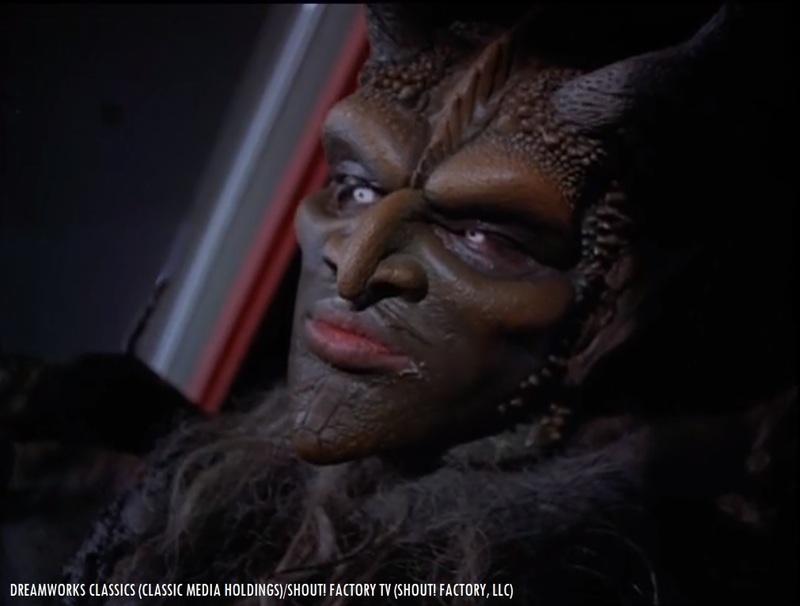 Bernie Casey in the lead gargoyle character, with make-up effects designed by Stan Winston in B.W.L. Norton‘s “Gargoyles” (1972). Winston and his studio worked on numerous special effects and make-up designs for many successful feature films, including James Cameron’s “The Terminator” (1984), Fred Dekker’s “The Monster Squad” (1987), Tim Burton’s “Edward Scissorhands” (1990) and Steven Spielberg’s motion picture adaptation of Michael Crichton’s “Jurassic Park” (1993). Cornel Wilde and Bernie Casey in B.W.L. Norton‘s “Gargoyles” (1972). According to IMDB’s trivia section on “Gargoyles” (1972), Norton’s made-for-TV feature was filmed in 18 days. Norton was not original considered to direct “Gargoyles” for GE’s “Tomorrow” film unit; he replaced a previous director who was not into the idea of filming a made-for-TV production in less than 18 days. One camera was used for the entire production of Norton’s feature, according to additional details from IMDB. Bernie Casey and Cornel Wilde in “Gargoyles” (1972). Norton’s “Gargoyles” (1972) was filmed on location at Carlsbad Caverns National Park in Carlsbad, New Mexico and in Laredo, Texas. Throughout the production for outdoor sequences, the temperatures rose over 100 degrees Fahrenheit (according to additional information from IMDB). 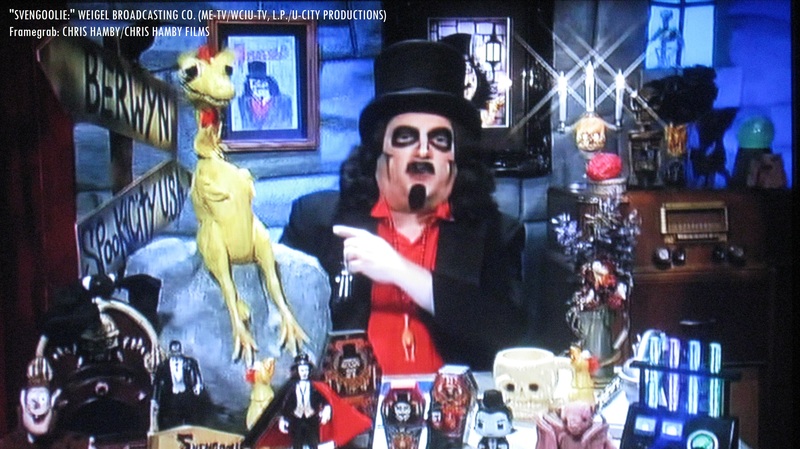 Be sure to watch Svengoolie’s showcase of “Gargoyles” (1972), this Sat. on Me-TV! A brief sneak preview clip of “Gargoyles” (1972). Svengoolie (portrayed by Rich Koz), Kerwyn and all fellow SvenPals are excited for the return of “Gargoyles” (1972), this Sat. on Me-TV! Kick off the month of Nov. with Svengoolie and the return of B.W.L. Norton’s “Gargoyles” (1972), this Sat. on Me-TV! With Sven’s extended fun facts, Doug Graves’ evening parody song, Kerwyn’s “mail call” segment and an ensemble cast featuring Bernie Casey, Cornel Wilde, Jennifer Salt, Scott Glenn, Woody Chambliss, Grayson Hall, Vic Perrin, Mickey Alzola, Rock Walker and Greg Walker; you will not be disappointed! Highly recommended to all fellow SvenPals and aficionados of cult creature features! Live-tweet with all fellow coast-to-coast SvenPals (via Twitter) during #Svengoolie’s big broadcast of “Gargoyles” (1972) on Me-TV! “Silver Screen Reflections: ‘Flashback’ edition” on Sven’s May 2017 Me-TV premiere of “Gargoyles” (1972)! Berwyn’s very own and Chicago’s very own! Sven’s alter-ego, Rich Koz and Sven/Me-TV executive producer Jim Roche’s Oct.29/early Oct. 30 guest host appearance on WGN Radio’s “Nightside!” Also includes Sven/Rich and Jim’s guests from the Oct. 29/Oct. 30 broadcast, award-winning make-up effects artist Michael Burnett and comedian/actor/writer Dana Gould (of “Stan Against Evil” fame)! On Halloween day tomorrow (Wed., Oct. 31), Sven will be making a morning guest appearance on WGN Radio’s “Bill and Wendy Show” with Bill Leff and Wendy Snyder at 11:35 a.m. Central/12:35 p.m. Eastern (AM 720 for fellow Chicago/Berwyn SvenPals, wgnradio.com for fellow coast-to-coast SvenPals)! And there will be more Sven on your radio dial on Halloween day! Fellow Berwyn/Chicago SvenPals can hear Sven on Halloween day on the airlanes of Me-TV FM 87.7 (on your FM dial) and fellow coast-to-coast SvenPals who subscribe to SiriusXM Satellite Radio can hear Sven’s Halloween appearance on SiriusXM’s “70’s on 7” channel! And on Halloween night (for our fellow Chicago/Berwyn SvenPals and fellow coast-to-coast SvenPals who are traveling to Berwyn/Chicago to see the event), Sven will be making an appearance with the legendary Chicago Bulls basketball team during the Bulls’ Halloween evening game (United Center in Chicago, Illinois)! (Postponed due to WNUR’s Sports-A-Thon Sports programming pledge drive on Nov. 3): Jam along to a festival of extra Halloween tunes with fellow super SvenPal Jamie Lee and her live Sat. morning WNUR/Northwestern University big broadcast radio show, “Jammin’ with Jamie!” Jamie’s post-Halloween jam session of extra Halloween songs will now air on Sat., Nov. 10 at 6 a.m. Central/7 a.m. Eastern on WNUR-FM 89.3 (in the Chicago/Berwyn area) and simulcasting from coast-to-coast and around the world on WNUR.org and/or the TuneIn platform! Again, if you have a Halloween-related song from cinema, theatre or television in mind for Jamie’s upcoming big broadcast, be sure to send in your song request(s) to Jamie’s official Twitter page or Jamie’s official site before Jamie’s big post-Halloween broadcast this Sat. on the WNUR airlanes! A wonderful array of Halloween-themed series jam sessions ranging from spooky supernatural tunes to monster mashes and trick-or-treat melodies! We fellow super jammers and SvenPals are looking forward to this week’s jam session of extra Halloween favorites, Jamie! We’re all rooting for you from coast-to-coast! Keep on jammin’! And again, be sure to donate generously/spread the word to help one of Jamie’s PM&L friends’ additional medical treatments (via GoFund Me) by helping to offset the high expenses! –C.H. Belated anniversary of “Silver Screen Reflections!” Sept. 27, 2018 marked the third anniversary of my blog site, “Silver Screen Reflections.” Originally established as a blog site for my online journalism course at my Alma Mater, Hood College (graduated in 2017), I have had many exciting and fun experiences related to the field of classic/cult cinema, including Svengoolie’s Sat. Me-TV big broadcast showcase, The Mads (Trace Beaulieu and Frank Conniff of MST3K fame) Mystery Science Theater 3000, Turner Classic Movies, Shout! Factory/Shout! Factory TV, The Mads and RiffTrax, just to name a few! Sept. 2018 also marked third anniversary on Twitter (@chrishambyfilms), where I have made many wonderful friends of the matinee from coast-to-coast and around the world with fellow super SvenPals, MSTies of MST3K and classic/cult film enthusiasts! Most importantly, I would like to thank all my fellow super SvenPals of Svengoolie, MSTies of MST3K, Hood College alums and classic/cult film and TV enthusiasts throughout the nation and around the globe for enjoying, reading, commentating and sharing my blog posts! Highly appreciated! Let’s all keep on having fun and enjoying the classics! Peace and “Hi-Keeba!” Yours truly to all and all the best, -C.H. And happy Halloween eve and Halloween to Sven and to all my fellow super SvenPals everywhere! May you all enjoy this Halloween! Make it a safe and happy one! -C.H. “Gargoyles” (1972) is also available to watch for free on Shout! Factory’s streaming platform, Shout! 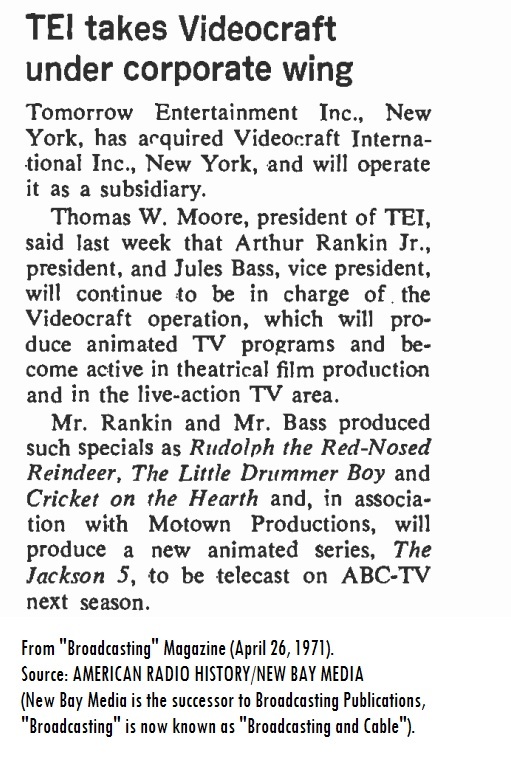 Factory TV, by arrangement with DreamWorks Classics, owners of the Classic Media, LLC/Tomorrow Entertainment holdings. Questions/comments about “Svengoolie” and/or the return of “Gargoyles” (1972)? Drop a line at the comments section!